Despite recent efforts to increase naval patrols, pirate attacks and incidents of armed robbery at sea have continued throughout the Gulf of Guinea and in particular in the Niger Delta region of Nigeria and off the coast of Benin. The region is extremely resource-rich, with oil, cocoa, and various minerals filling tankers and bulk carriers. Since the beginning of 2012, there have been numerous attacks on such vessels in the Gulf of Guinea. Such attacks tend to be more violent than those in the Indian Ocean. For example, in one recent attack, pirates killed the captain and chief engineer of a cargo ship off the coast of Lagos, Nigeria. A number of recent developments in the dynamics of this criminality and the international community’s efforts at addressing it are worth surveying here. It has been suggested that increased militancy in the Niger Delta region is the root cause of the rise of piracy in the Gulf of Guinea. For example, in another recent attack, the captain and chief engineer of a Dutch ship were kidnapped and a crew-member injured. MEND, the Movement for the Emancipation of the Niger Delta, whose mission is to fight for a fairer distribution of Nigerian oil revenue, has been accused of involvement in the recent pirate attack. But MEND has specifically disclaimed responsibility and refused to mediate between the pirates and hostage negotiators. Nonetheless, MEND continues to operate in the Niger Delta despite a widespread amnesty last year aimed at disarming the movement and claims to be responsible for the recent killing of Nigerian police at a marine checkpoint. Nigerian security forces deny this claim. What can be said is that just as with Somali piracy, there has been a tendency to conflate terrorism and piracy in the Gulf of Guinea without a thorough factual analysis. That said, other types of transmaritime criminality clearly interact with and will have an effect upon piracy in the Gulf of Guinea. The removal of subsidy has choked our business. It is no longer lucrative as the price of fuel in Cameroon is between N160 and N180 per litre; by the time you bribe some officials of the two countries at the border, what you get after selling the fuel is not encouraging at all. Although the reduced fuel subsidies will have the effect of reducing cross-border fuel smuggling, these criminals will be looking for other sources of revenue and could look to piracy as a new source of income. The situation is further complicated by the presence of a more expansive variety of transmaritime criminality in the region, including drug trafficking, illicit fishing, illicit dumping of toxic waste, and illegal or clandestine immigration or migration. For example, The United Nations estimates that $1 billion worth of cocaine, destined for Europe from Latin America, passed through West Africa in 2008. Much of this criminality is perpetrated in and through maritime jurisdictions and will often be associated with pirates. A comprehensive solution must take all transmaritime criminality into account. In the face of this volatile situation, the UN undertook an assessment mission and issued two important documents regarding the Gulf of Guinea situation. A recent report of the Secretary General sheds some light of the general features of West African piracy and how the international community plans to address it. 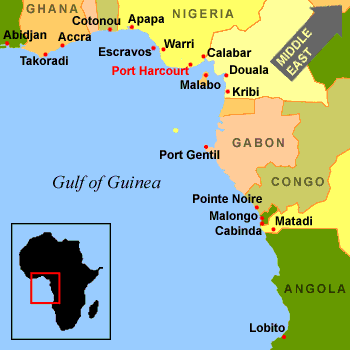 The UN Secretary General reported on 19 January 2012 (only recently released) that piracy in the Gulf of Guinea since the late 1990s has focused on high-value assets, particularly oil shipments. Shell executive vice president Ian Craig has noted that as much as 150,000 barrels of crude a day is being stolen by oil thieves in the Niger Delta. But since Nigeria has responded robustly to the growth of piracy, attacks have migrated to the Benin port of Cotounou (19 nautical miles to the west). Recent attacks are generally targeted at oil and chemical ships at a distance of over 40 nautical miles from shore (i.e. on the high seas). Pirates generally steal cargo and sell it on the black market – as opposed to holding the goods or crewmen for ransom (as in Somalia). These attacks have had a significant impact on the economies of West Africa. There are 70 percent fewer ships entering the Cotounou port. This port is the entry point for goods to in-land countries such as Niger, Mali, and Burkina Faso who will also suffer from increased costs due to scarcity of goods and increased insurance rates on all maritime shipments. In contrast, attacks off the Central African coast mainly target oil drilling platforms and ships in order to steal money and goods from crew. The combined effect of these types of piracy is an estimated annual loss of $2 billion to the West African subregional economy. However, West African countries have had somewhat more success than their East African counterparts in mobilizing regional resources and coordinating efforts to prevent and punish pirates. Of particular note is the cooperation between Nigeria and Benin in conducting joint patrols (albeit with some international contributions). Their relative success may be partly attributable to a more limited geographic area of recent attacks (as compared with Somali pirates who have perpetrated attacks over 1000 nautical miles from the coast of Somalia). More importantly this is attributable to the fact that there are robust state institutions in the areas targeted by pirates. That said, more must be done to increase state capacity, and, in particular naval capacity. Furthermore, pirates are bound to find where governance structures are the weakest and to take advantage of those failures (e.g. by launching attacks from states lacking effective naval or coast guard patrols). As a result of this organic cooperation, the UN and the international community have taken a secondary role in the fight against piracy in the Gulf of Guinea. The UN, both in the UNSG’s report and in its Security Council Resolution, lauds the current littoral state cooperation and encourages the Gulf of Guinea states to strengthen this cooperation, while promising to provide international financial assistance where required. It is clear from the statements of a number of representatives after the 27 February 2012 briefing on the UNSG report that a number of states would prefer to leave West and Central African states to take the lead in enhancing regional security against piracy and armed robbery in the Gulf of Guinea. The U.S., for one, has responded to this call by committing about $35 million for the training of naval personnel in Nigeria and other countries within the Gulf of Guinea on how to combat piracy and other maritime crimes. It is not suggested that the international community should create a joint naval force, such as EUNAVFOR, to combat pirates. This may encourage a reliance on PMSCs in the Gulf of Guinea where shippers lack confidence in littoral state navies. to consider a comprehensive response in the region and [for] the States of the Economic Community of West African States (ECOWAS), the Economic Community of Central African States (ECCAS) and the Gulf of Guinea Commission (GGC) to develop a comprehensive strategy, including through: (a) the development of domestic laws and regulations, where these are not in place, criminalizing piracy and armed robbery at sea; (b) the development of a regional framework to counter piracy and armed robbery at sea, including information-sharing and operational coordination mechanisms in the region; and (c) the development and strengthening of domestic laws and regulations, as appropriate, to implement relevant international agreements addressing the safety and security of navigation, in accordance with international law. The planned conference (a “joint regional summit of Heads of State of the three regional organizations”) is to take place as soon as possible in 2012, but has not yet been assigned a specific date or location. As this conference approaches, regional organisations would do well to consider that further developing regional coordination will be key to formulating a comprehensive counter-piracy strategy in face of the resource fragmentation that currently exists in this sector. Very good current overview, Roger.